Flora and Fauna: Puma, Ocelot, Tapir, Black Tinamou, Military Macaw, Jacamar Pechicobrizo, Elenita Tropandina. From Quito: The Narupa Reserve is located approximately 4 hours from the city of Quito. Take the Papallacta-Baeza-Cosanga route, go through the Guacamayos mountain range until you reach the "Y" that divides the route to Tena and Coca, take the road to Loreto-Coca and travel 1400 meters before reaching the river bridge Hollin Chico. The entrance is on a curve where there is not enough space for vehicles, so the best option is to continue on the road to the restaurant "Susanita" where there is a parking lot. In the restaurant you can buy tickets to the reservation. In the reserve there is diversity of Tangaras, Mosqueros and Hummingbirds; A pair of Falcon Pechinaranja has also been found, which has been breeding for some years in a cliff adjacent to the reserve, this is the only nesting site in Ecuador of this Hawk species, which is also in danger of extinction. The reserve acquires the name of Narupa by a species of palm that is located in the eastern province of Napo. 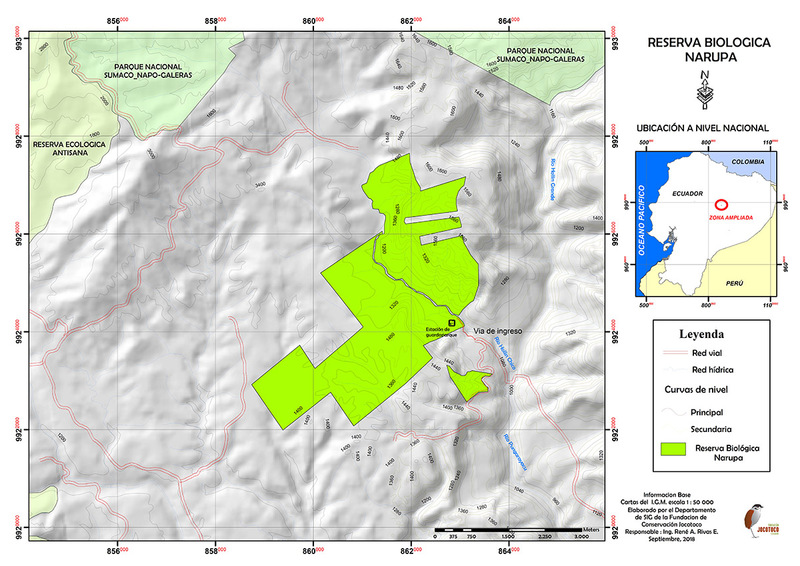 This was established with the objective of protecting a block of "Evergreen Low Montane Forest", since in this region it is threatened by deforestation for agriculture, since its lands are subtracted for this activity. The reserve has an approximate of 300 species of birds, although it is estimated that it increases to 400 species, since, the reserve has some unexplored areas. So far in Narupa we find 2 of the 5 species globally threatened as: the Flag and the Cerulean Warbler. Additionally, some hummingbird drinking troughs have been installed. You want to visit the reserve Narupa?